Capital of the Spanish province of the same name. It is said to have been inhabited by Jews from the earliest times; hence it was also called "Villa de Judios" (City of Jews), and, like Cordova, it was entrusted by the Arabian conquerors to the Jews for guardianship. Granada, which was chosen for the capital of the ancient kingdom of the same name (1013), instead of the neighboring Elvira, reached the height of its glory under the calif Ḥabus, who raised Samuel ibn Nagdela to the position of vizier or minister of state. As in all Mohammedan countries, the Jews lived in Granada in perfect freedom; and several of them—Joseph ibn Migash (who was sent on diplomatic missions), Isaac ben Leon, and Nehemiah Ashcafa, for example—occupied influential positions. Since the Jews of Granada were rich and powerful, they interfered at times in the dynastic quarrels. "Who did not see the splendor of the Jews in Granada, their good fortune, and their glory," says a Jewish chronicler, "never saw true glory; for they were great through wisdom and piety" ("Shebeṭ Yehudah," p. 3). With the downfall and murder of Joseph ibn Nagdela, who had succeeded his father as vizier, an outbreak against the Jews occurred: their houses were plundered; and all of the Jews, except a few who escaped by flight, were killed. More than 1,500 Jewish families, numbering 4,000 persons, fell in one day, Ṭebet 9 (= Dec. 30), 1066. This was the first persecution of the Jews since the dominion of Islam in the Pyrenean peninsula. The Jews throughout the kingdom were forced to sell their houses and lands and to leave the country; but they soon returned. 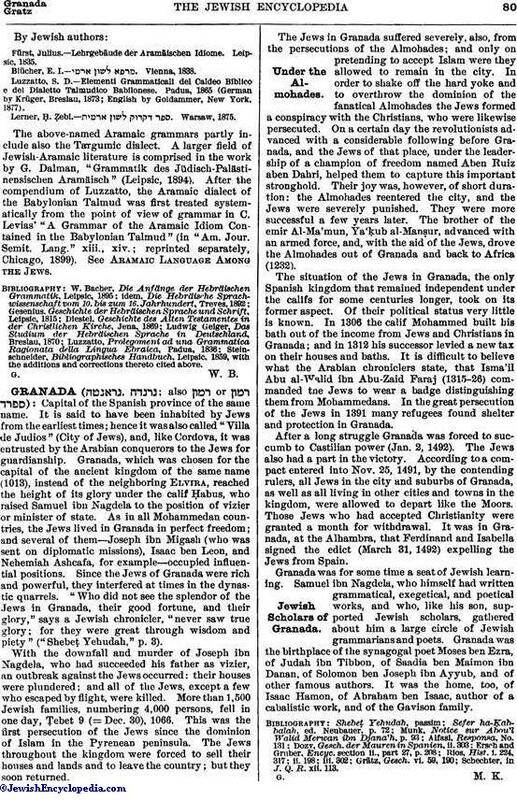 The Jews in Granada suffered severely, also, from the persecutions of the Almohades; and only on pretending to accept Islam were they allowed to remain in the city. In order to shake off the hard yoke and to overthrow the dominion of the fanatical Almohades the Jews formed a conspiracy with the Christians, who were likewise persecuted. On a certain day the revolutionists advanced with a considerable following before Granada, and the Jews of that place, under the leadership of a champion of freedom named Aben Ruiz aben Dahri, helped them to capture this important stronghold. Their joy was, however, of short duration: the Almohades reentered the city, and the Jews were severely punished. They were more successful a few years later. The brother of the emir Al-Ma'mun, Ya'ḳub al-Manṣur, advanced with an armed force, and, with the aid of the Jews, drove the Almohades out of Granada and back to Africa (1232). The situation of the Jews in Granada, the only Spanish kingdom that remained independent under the califs for some centuries longer, took on its former aspect. Of their political status very little is known. In 1306 the calif Mohammed built his bath out of the income from Jews and Christians in Granada; and in 1312 his successor levied a new tax on their houses and baths. It is difficult to believe what the Arabian chroniclers state, that Isma'il Abu al-Walid ibn Abu-Zaid Faraj (1315-26) commanded the Jews to wear a badge distinguishing them from Mohammedans. In the great persecution of the Jews in 1391 many refugees found shelter and protection in Granada. After a long struggle Granada was forced to succumb to Castilian power (Jan. 2, 1492). The Jews also had a part in the victory. According to a compact entered into Nov. 25, 1491, by the contending rulers, all Jews in the city and suburbs of Granada, as well as all living in other cities and towns in the kingdom, were allowed to depart like the Moors. Those Jews who had accepted Christianity were granted a month for withdrawal. It was in Granada, at the Alhambra, that Ferdinand and Isabella signed the edict (March 31, 1492) expelling the Jews from Spain. Granada was for some time a seat of Jewish learning. Samuel ibn Nagdela, who himself had written grammatical, exegetical, and poetical works, and who, like his son, supported Jewish scholars, gathered about him a large circle of Jewish grammarians and poets. Granada was the birthplace of the synagogal poet Moses ben Ezra, of Judah ibn Tibbon, of Saadia ben Maimon ibn Danan, of Solomon ben Joseph ibn Ayyub, and of other famous authors. It was the home, too, of Isaac Hamon, of Abraham ben Isaac, author of a cabalistic work, and of the Gavison family. Schechter, in J. Q. R. xii. 113.